Naysayers are quick to scoff at medium-speed electric vehicles as “useless”, arguing that they’re too slow and don’t go far enough on a charge (OK, they say that part about almost all EV’s).Â What these people fail to understand is that their vehicle needs are not the same as everyone else’s vehicle needs. Tens of thousands of people in North America and elsewhere have already bought and are using low- and medium-speed electric vehicles for local driving, from actual golf carts, to NEV’s (neighbourhood electric vehicles), to faster cars such as the classic Citicar/Commutacar, to the newer Zap Xebra. And now they’re building their own, on the cheap! Understand that you probably can’t build a highway capable EV with a 40+ mile range on the cheap.Â (But if you’ve done it, drop us a line! )Â Each of these cars tops out around 45 mph, and a more realistic “working” top speed is probably low to mid 30’s.Â Steep hills are to be avoided. Read the build threads for these vehicles and you’ll discover lots of creative low-cost recycling ideas.Â “Repurposed” parts in the ForkenSwift, for example, include bits from a dead inkjet printer, old tricycle, dead 12v cooler, old bed frame, used welding cable and more. 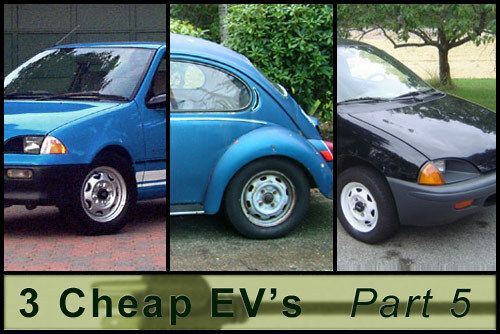 The challenge of buying used parts and scouring eBay for killer deals is that it will probably take some time to find the things you’ll need.Â If you’re an impulsive type prone to temper tantrums when you can’t get something you want RIGHT NOW, a budget EV project is probably not for you. Just because you’ve decided the internal combustion engine is useless for your purposes, doesn’t mean it’s actually worthless.Â In the case of both Metro projects, slightly more money was recovered by selling good parts (fuel tanks, radiators, working engines) than the cars originally cost!Â As well, hundreds of dollars were recovered by selling the forklift chassis after stripping the electric parts. By definition, a medium speed budget EV is not going to need to carry a lot of batteries or generate a lot of power.Â Which means you should try to find a lightweight host car to keep the overall power to weight ratio manageable. The biggest fleets of EV’s in the world are found in warehouses and on golf courses.Â The companies that sell/service/repair these vehicles are potentially a good source of affordable used parts, particularly if you take an entire old unit off their hands. 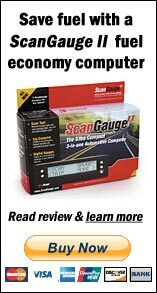 The lower your system voltage, the lower your component and battery costs.Â That said, a 48 volt 400 amp subcompact car is just barely workable in what most people would consider normal driving, and only on flat roads.Â A 72 volt setup is more realistic, and as it turns out, motor controllers that can handle 72 volts seem to be just below a threshold where the price goes up significantly. A 48-72 volt battery pack (assuming lead-acid) also keeps you closer to the weight limit that a smaller host vehicle can carry without exceeding its gross vehicle weight limit (affecting suspension & braking ability). Second hand batteries can be a viable option, which is good because along with the motor and motor controller, the battery pack is one of the 3 costliest parts of an electric conversion.Â Depending on your range needs, it is possible to find used ones that may meet your minimum range goals.Â Two of the three cheap EV’s featured in this series are running on batteries from other EV’s owners which were either upgraded, or replaced once they no longer met their minimum range needs. Well – what are you waiting for? Hi, just a bmall note to say a BIG thank you for the encouragement all Ecomodder comments give me, a 66 year old with hopefully a good few recycling miles left in me. Doing Irelands Cancer Care conversion–start date 1st April 2009 –with mechanical knowledge but new–i mean NEW–to Fork Lift welectrics I,m converting a Toyota Corolla using re-cycled parts –primarily v36volt and 48volt parts. with a whole bundle of local help to complete the EVcar. (yet to be named via a School competition.